It's time for another edition of the SNB Stock Report. After a fun-filled fight weekend, whose stock has gone up (+), whose has gone down (-) and whose remains unchanged (NC)? Keith Thurman (+) Thurman returned to boxing after a 22-month layoff on Saturday and defeated the good version of Josesito Lopez by a majority decision. On the plus side of the ledger, Thurman looked to be in excellent shape. His athleticism remained stellar, he landed his fair share of hard shots and his chin held up nicely even after he was pounded from pillar-to-post in the seventh round. He scored a knockdown in the second round with a beautiful short counter left hook. However, there were some troubling signs in the fight. No, it's not that big of a deal that Thurman got hit or even hurt; those things happen in boxing. But what was of genuine concern occurred in that seventh round. Instead of holding or slowing the pace of the fight after he got hurt, Thurman continued to run around the ring like a chicken with his head cut off. Or, to use a boxing comparison, he looked like Amir Khan. Instead of relying on his brains, he burned off a lot of energy, invited more trouble and assumed that his athleticism would enable him to survive. Yes, Thurman was able to regroup, but can those tactics work against bigger punchers and better fighters? I have my doubts. 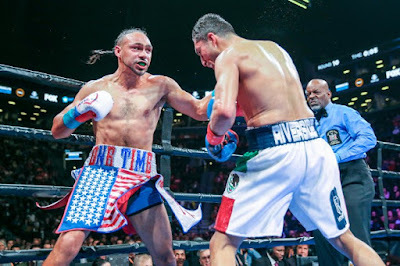 Overall, Thurman successfully shook off some cobwebs and fought very well at points in the match, but his questionable ring instincts could get him into a lot of trouble against the elite at welterweight. Josesito Lopez (+) By all accounts Lopez had a successful training camp for his fight with Thurman and it showed in the ring on Saturday. He went 12 tough rounds with one of the best welterweights in the world, displaying solid conditioning, desire and self-belief. Lopez was perhaps just seconds away from ending the fight in the seventh, but couldn't come up with the finishing blow. Nevertheless, it was an encouraging performance. Despite the loss, he was able to impose his will on one of trickiest opponents in the division, one who had far more athleticism and punching power than he did. Furthermore, Lopez may not have even won a round in the first half of the fight, yet he persevered. Lopez's lively performance and his positive intangibles should help him secure another meaningful fight later in the year. Jaime Munguia (NC) Ignore the scorecards for this one, which officially show a wide unanimous decision victory for Munguia. Yes, Munguia won the fight and retained his junior middleweight title, but he had to engage in a brutal war to do so. Munguia landed sparkling power punches throughout the fight; however, Inoue, the much smaller guy, kept coming forward and tried to bully the bully. There were many rounds in the fight where Munguia landed the types of blows that would put away less-determined foes, but Inoue was no ordinary opponent. Despite a number of positives in his performance, Munguia still has several areas that he needs to improve. His defense remains a concern. He made no adjustments to Inoue's looping right hands and he doesn't seem to be making a concerted effort to improve his defensive technique. In addition, perhaps if Munguia was in better conditioning, he wouldn't have spent so much time along the ropes, where he was often target practice. To my eyes, Munguia looks like a middleweight trying to shrink down to 154 lbs. He might be able to get away with it for another fight or two, but this approach usually ends in one of two ways: he loses his title belt on the scales or he comes into the fight dead at the weight and gets knocked out. Yes, the 160 lb. division has some elite talents in the division, but it's better to lose to Canelo than to the 12th-ranked contender in the WBO at 154 lbs. Jaime, the choice is yours. Takeshi Inoue (+) Inoue entered Saturday's fight as a relatively obscure opponent without much of a pedigree – 13-0 with 7 KOs, facing no one that would be confused with a contender. But no one told Inoue that he was the "opponent." Despite absorbing thunderous blows throughout the fight, he relentlessly charged forward and had periods of sustained success with looping and overhand rights. The final scores were essentially academic; Inoue wasn't going to win that type of fight on the cards, nor did he deserve to. But Inoue placed himself squarely on the boxing map on Saturday. He'll now be deemed as an acceptable opponent for any of the top guys at 154 and stands to make more money for his efforts going forward. Altogether, that's a successful outing. Adam Kownacki (+) Kownacki blitzed through former title contender Gerald Washington in two rounds and further demonstrated that looks can be deceiving in boxing. Kownacki has a terrible boxing body. He's overweight and has no mobility, but he can really punch! In a magnanimous gesture, Washington decided to stand and trade with Kownacki in the first round and Adam was the winner of that shootout. Shortly into the second round, Kownacki scored with a punishing right hand and Washington was on the canvas. Although he beat the count, Washington was done and the referee called the fight off after Kownacki continued his onslaught. Of course Kownacki has some flaws that could stop him from beating the truly best at heavyweight, but he entertains in the ring, packs a punch and fights with a lot of self-belief. Boxing would be a lot more enjoyable if there was a Kownacki in every division. Gerald Washington (-) In early 2017 Washington had some good moments against heavyweight champ Deontay Wilder. Washington demonstrated in the first four rounds of that fight that he could box and had athleticism. Ultimately, he didn't survive against Wilder, or against Jarrell Miller, and that was again the case on Saturday against Kownacki. Perhaps most perplexing is that Washington didn't try to use any of his superior attributes on Saturday. Instead of boxing or using his legs, he engaged in a slugfest. It was perhaps the worst game plan in boxing since Jose Pedraza decided to charge at Gervonta Davis with reckless abandon. Sometimes fighters make baffling decisions. Tugstsogt Nyambayar (NC) King Tug faced the hardest challenge of his career on Saturday against the capable southpaw Claudio Marrero. In an excellent fight with numerous ebbs and flows, Nyambayar won a competitive unanimous decision. Although Nyambayar entered the fight with nine knockouts in his ten fights, it doesn't appear that his power is elite. Furthermore, Tug demonstrated that he doesn't yet have the conditioning to impose himself over 12 rounds. (In his defense he hadn't needed to reach for those reserves prior to Saturday.) Nevertheless, he is still a work in progress. Supposedly with his win he will be in line for a title opportunity against Gary Russell Jr. To be blunt, he isn't ready for that fight and hopefully his team pulls back the reins a little bit. Tug has power and good boxing skills, but he needs more professional seasoning.